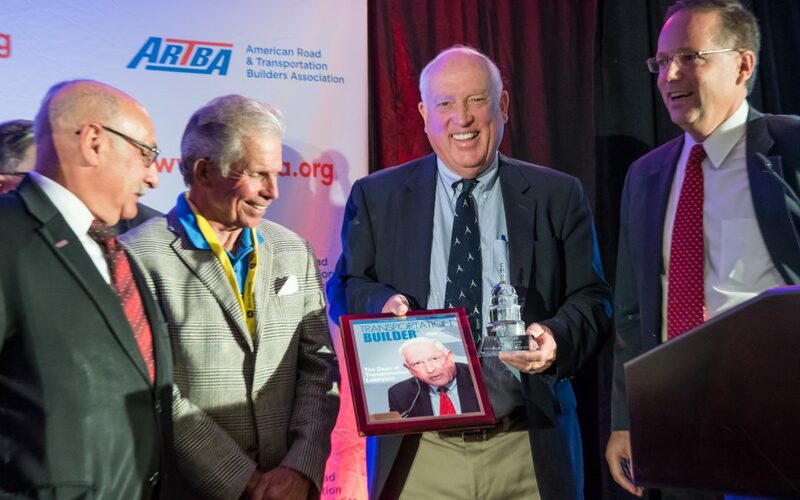 Dr. T. Peter Ruane receives the ARTBA award from Chairman Matt Cummings of AECOM, right, as past chairs Paul Yarossi of HNTB, far left, and Bill Cox of Corman Kokosing look on. Dr. T. Peter Ruane, president and CEO of ARTBA for 30 years, is the 2018 recipient of the “ARTBA Award,” group’s highest honor. It was presented Oct. 1 during a special session at the association’s National Convention in New York City. Established in 1960, the ARTBA Award recognizes individuals for outstanding contributions that have advanced the broad goals of the association. Over the years, recipients have included several governors, more than 25 U.S. senators or representatives, two U.S. secretaries of transportation and dozens of top leaders and executives from government and the private sector of the transportation construction industry. Ruane is set to retire Nov. 1 as the longest-tenured head of the 116-year-old organization. Known as the “Dean of Transportation Lobbyists,” he has been a leading force in federal transportation investment policy and politics in the Nation’s Capital. Ruane has been a fixture witness at congressional hearings and provided counsel to administrations from both political parties. When Ruane joined ARTBA in 1988, the total annual federal investment in the U.S. highway and transit programs was $16 billion. Today, it is $60 billion.